My kids love getting their own mail, and I think it is great when companies come out with magazines just for kids. I recently got the opportunity to review for National Geographic Little Kids and I am thrilled with what they designed perfectly for the age 3 to 6 year old range. My 3 year old and (almost) 5 year old absolutely love this magazine! The kids love the pictures of all the animals, games and puzzles to help further their education, and all the stories. The National Geographic Little Kids magazine is packed with teaching tools to help parents inspire a love of learning in their children. 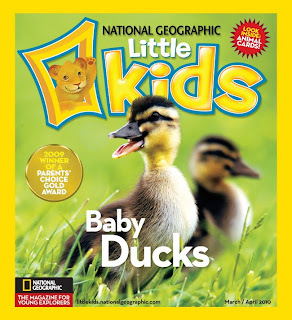 The Association of Educational Publishers chose National Geographic Little Kids for its highest award, the Golden Lamp, in 2008 and named the magazine Periodical of the Year in 2008 and 2009. National Geographic Little Kids also won a Parents’ Choice Gold Award for 2008, 2009 and 2010. The photographs of the animals are great, and my kids and I really enjoy talking about the animals, like what they do, where they live, what they eat, etc. The National Geographic Kids magazine has 24-pages in each issue contains animal stories, answers to questions on kids’ favorite topics, features on different cultures to inspire a sense of understanding about the world, plus interactive experiments to introduce simple science. My kids love the cards inside the magazine, and love to pretend that they are trading cards (like their older brother has trading cards). There are a set of six cards inside each magazine that come out, and have pictures of animals with their facts on it. I really like how the National Geographic Little Kids is a perfectly sized magazine for little hands, and my kids love imitating us by holding their magazine and sitting in the chair. I love that my kids "teach" each other about what they are learning in their National Geographic Little Kids magazine. This great children's magazine is available by subscription for $15 a year (six issues; international subscription cost varies) and on newsstands for $3.99 a copy. Parents can explore online with their kids at littlekids.nationalgeographic.com. We recommend this great magazine for your family! My kids love it, and we are happy to share this with you! National Geographic Little Kids is generously sponsoring to give away ***UPDATE*** (my error)~ this contest is for the current issue (one copy) of National Geograpic Little Kids, not a 1 year subscription as I had previously stated. I am so sorry about the misunderstanding. This contest is open to those in the United States (bloggers or non-bloggers). To enter, go to the National Geographic Kids website, and find something interesting to you...and comment here about it. Contest will end on April 27th at midnight. This review was written as part of a campaign for the Family Review Network. Thank you to National Geographic for sending sample magazine issues free of charge. I was also offered a chance for my readers to enter a giveaway with the sponsorship from National Geographic Little Kids. I was not compensated for my time or written review. You can send a gift subscription of National Geographic Little Kids magazine to a child in another country outside the US for approximately $30. I love the little ants running across the page LOL - seriously my kids would LOVE this and in fact if I don't win I may just have to order a subscription! National Geographic is a Parents' Choice winner for 2008. Check out the National Geographic store. I really liked the Fly and Discover Talking Globe and the Wanna Catch a Bite T-shirt. You get a free world ball toy for your kids with an annual subscription to National Geographic Kids. They have neat activities and crafts on their site. I like that they have games on their website for kids! Lots of interesting videos for kids to watch on the National Geographic website. I would love to win this giveaway for my 2.5 yr old quads & 7 yr old son. DogEared Books Blog sounds very interesting! follow on Networked Blogs on FB. Lots of interesting photos to look at under the photo tab of the National Geographic website. We checked out the Giant Jellyfish Invasion, since my daughter is fascinated with jellyfish! WOW! What a really cool contest! Thanks for hosting. I've been looking at this magazine as a potential buy for our kids. (My son LOVES animals.) But what better way to check it out than to win it! I went to the website and I love the fact that they allow their readers to interact with them a great deal. I found the video of the song a little girl had composed to remember the order of the planets. Nice! I love the activities on their site. I am always looking for fun things to do at home with my kids. I like the creature feature. I love the educational games on this site! I saw this cute craft using recycled shoes. Neat! I love the experiments listed.